During the 2009-10 Antarctic field season, the UNAVCO polar group supported 23 individual PI-based science campaign projects. Forty five receivers were sent to the continent for campaign support, including ten NetRS systems. Nine of these NetRS receivers remain on the ice to support long term data collection at WAIS divide under the upcoming WISSARD project, including one configured to relay data back to UNAVCO via Iridium modem. Real Time Kinematic (RTK) capabilities were provided to accurately calibrate navigation control for two state of the art underwater ROV's (B-174, B-211). GPS instruments were provided for the ongoing deformation studies on Mt. Erebus (G-081) and in support of the Dry Valleys Long Term Ecological Research projects (Doran, McKnight, Fountain). Two projects were supported during the period prior to the station opening to the summer crew. Among these was one of two groups (O-400 Casano) requesting high rate base data for aircraft geo-referencing purposes. Six POLENET style continuously operating GPS systems were prepared for the LARISSA team (C-514/C515) for installation along the east side of the Antarctic Peninsula. Five of these were successfully deployed, despite difficult ice conditions. An effort was made this season to recover two continuously operating GPS stations on the Pine Island Glacier. These had been buried by two years of snowfall. One was recovered, the other found to be in a crevasse field, and not safely accessible. This season saw heavy use of UNAVCO's terrestrial LiDAR system. The instrument has consistently proven itself a workhorse the frigid Antarctic environment. Data was collected in locations ranging from the McMurdo Dry Valleys to the top of Mount Erebus. Investigators taking advantage of the UNAVCO terrestrial LiDAR included Barrett (B-023), Doran (B-211), Lyons (B9420), McKnight (B-421), Fountain (B-425), Kyle (G-081), and Gilles (G-167). The continuously operating sites provided by TAMDEF and the Polar MRI projects continued to perform well.. Several sites were visited for minor maintenance and most had sustained well through the difficult winter months with minimal outages. Strengthened wind generators were installed at MACZ, high on Mt Erebus. Severe conditions on the volcano regularly batter these wind generators during the long austral winters. It is hopes that these more robust designs will pave the way to better, more reliable wind power in the future. Maintenance was performed at the CONZ installation, which also wintered well this past season. An early season communications bug necessitated replacing the receiver, but no data was lost. A seasonal NetRS Base station was again provided at Lake Hoare to service regional surveys in the Taylor Valley. Lake levels in the Taylor Valley continue to rise, prompting planning for a new benchmark installation at Lake Fryxell early next season. Benchmarks at all three lakes have suffered from advancing water lines. Data retrieval from Cape Roberts, Mt. Fleming, CONZ and MACZ continuous stations continues through the Truncated Cones repeater site on Mt. Erebus. Data are downloaded daily and delivered directly to the UNAVCO data archive. The telemetered data is collected by receivers at the NASA building 71 in McMurdo. Careful inspection found that all hardware at bldg 71 survived the winter in good condition. 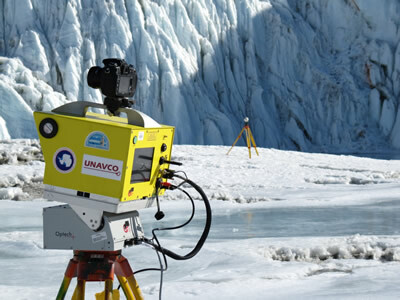 UNAVCO had an opportunity to travel to the remote Pine Island Glacier and was able to retrieve one of two continuously operating GPS systems deployed on the ice stream two years ago. The rescued system had not communicated with UNAVCO for most of its deployment, but two fully uninterrupted years of data were retrieved from the receiver. 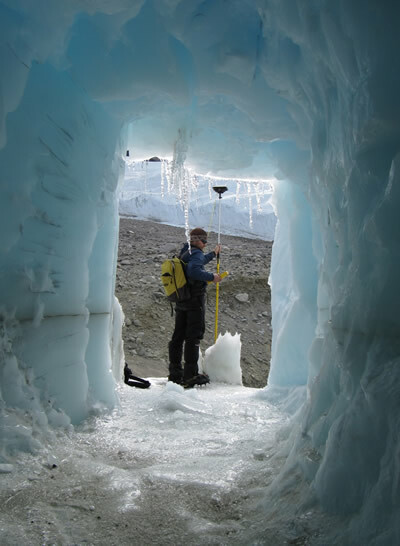 Figure 1 - UNAVCO Field Engineer Thomas Nylen measures the entrance to a sampling corridor carved into the side of the Taylor Glacier. Figure 2 - Terrestrial LiDAR scanner in use at the foot of the Taylor Glacier. The TLS provided surface topography data to augment sub surface side scan radar imagery taken by the ENDURANCE (Environmentally Non-Disturbing Under-ice Robotic ANtarctic Explorer).